Grace à PSN Liberator, vous serrez libéré (délivré) de vos jeux PSN. En fait, vous pourrez les convertir en PKG, dossier GAME ou ISO, mais aussi lui ajouter une mise à jour ou un DLC, et intégrer votre license. 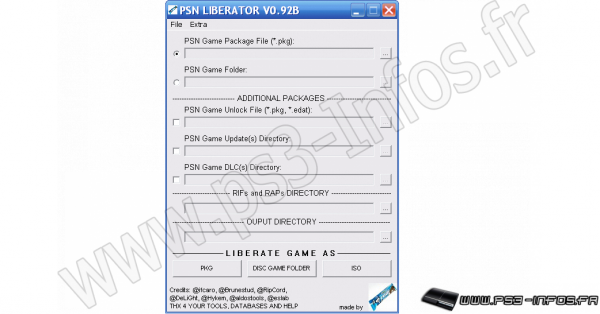 - Create a "Bubble"-PKG-Install-Disc with the liberated PSN Contents. 2. Find out the "GameID" of the game and search in "/dev_hdd0/games/" for a folder with exactly the name of that "GameID"
Copy that folder to "PSN CONTENT\LOCKED\PSN GAMES\"
a) all "*.rif"-files with the "GameID" in it's name and copy them to "PSN CONTENT\RIFsRAPs"
b) an "*.edat"-file with the "GameID" in it's name and copy it to "PSN CONTENT\UNLOCKS"
TIP: At 1st time just copy over all RIFs and EDATs you'll find. a) "PSN Game Folder" = "PSN CONTENT\LOCKED\PSN GAMES\[GameID]\"
- Sometimes an additional Unlock-PKG-File will be created. Install it to finally liberate the game. You can 1st try the liberated game without that Unlock-PKG-File installed. Not all games need them. Just try ! - Not all PSN-games will work when they are converted to disc. It's a matter of TRY & ERROR ! as "[GameID].PNG". This will most likely shorten the creation of a "Bubble"-PKG-Install-Disc with "Bubble"-Game-Icons. - While creating a "Bubble"-PKG-Install-Disc just drag&drop the PKG-Files, which should be included in the disc. Then arrange them to your likings. Create disc as game-folder or ISO. - If you've selected to use "Bubbles" with game-icons LIBERATOR will 1st search in "[LIBERATOR Programmverzeichnis]\GameIconCache\"
for a "[GameID].PNG"-file. If it's not there it will extract the PKG-file to get the "ICON0.PNG". This could take a long time. To avoid this you can add game-icons maunally to "GameIconCache". Just name them "[GameID].PNG". - Keep in mind that a "Bubble"-PKG-Install-Disc can get really big depending on the number of and size of the PKG-Files you've added. - Don't update liberated games online or offline !... else they will be locked again !